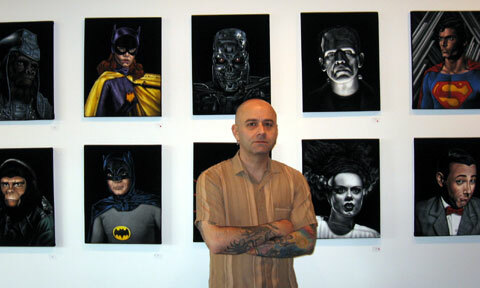 Velvet Geek is also known as Bruce White, a painter and tattoo artist. I have been tattooing for over 17 years and in 2009 turned to another under appreciated medium: black velvet. I feel that working with velvet gives my paintings a degree of visual contrast that cannot be replicated on any other surface. I use this medium to channel my nerdy admiration for many of pop culture’s most iconic characters. My work has been in group shows at Gallery1988, Mondo Gallery, Spoke Art, Shades of Grey, Wootini, Gauntlet Gallery, and Hero Complex Gallery, in addition to four solo shows at Gallery1988. My past client list includes Adult Swim, Funny or Die, HBO, FX, Comedy Central, Warner Brothers and New Line Cinema. I received my BFA in Printmaking from the University of North Carolina at Chapel Hill in 1995.